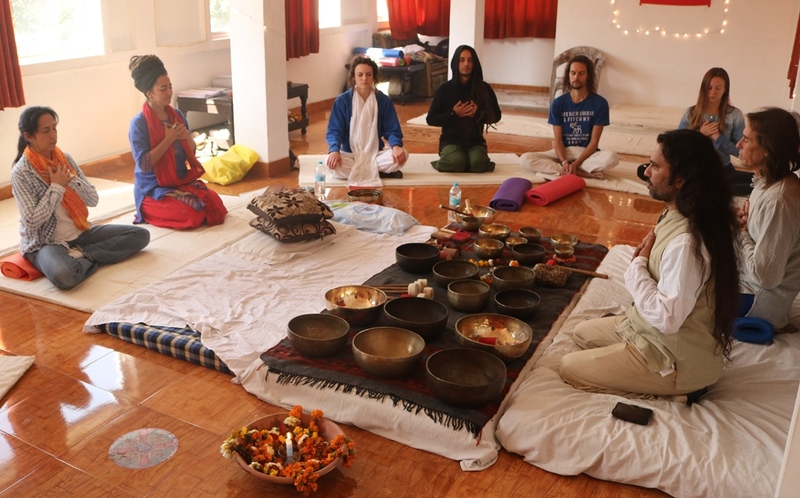 I had the beautiful opportunity to join Shiva and Shivam Satyam Sundaram Meditation School, in one of his 4 day Tibetan Singing Bowl trainings in the yoga capital of India: Rishikesh, in 2017. It was one of the highlights of my four-month stay in India, for not only did I receive excellent training and certification in something the entire world is asking for, but I also received a very unique and enjoyable Indian experience. 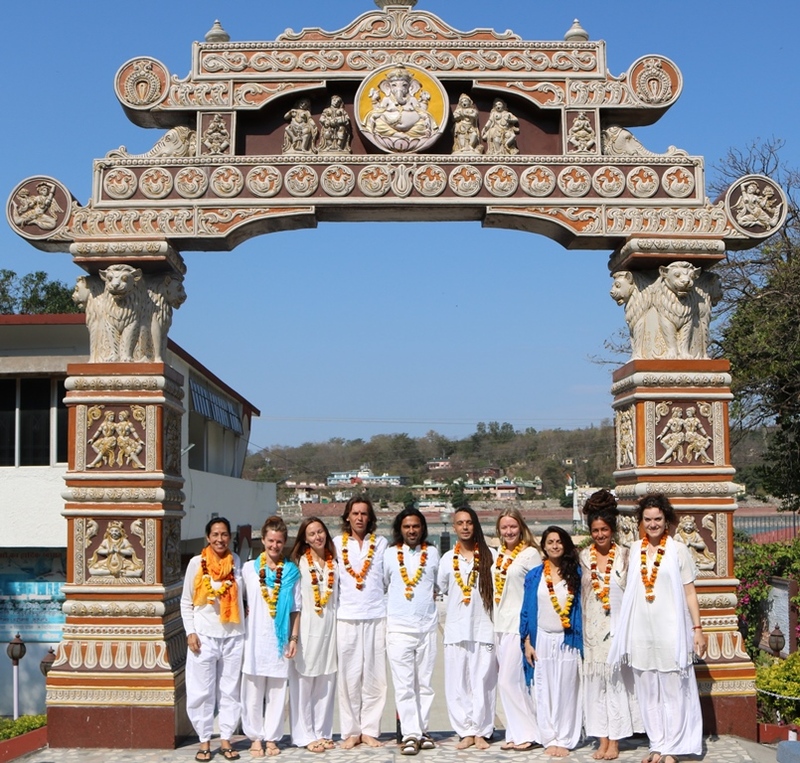 The program began on a warm, sunny morning, with breakfast together at an Ashram. We had been asked to arrive dressed in clothes of white, so it was easy to find the group and to meet the other beautiful souls I’d be sharing this experience with. Starting the program by sharing a meal together was a lovely way to join together with others in community and collaboration. Although many Ashrams in India provide tasty, authentic food, I appreciate that the Ashram Shiva chose for us for all our meals had different options to choose from (vs the standard one choice only), which was essential for many of us who were actually vegan (not just vegetarian), and who were also gluten free – both challenging options to find in India! We were then taken to a local Temple, where we received our own private ceremony to ‘officially’ begin the training. 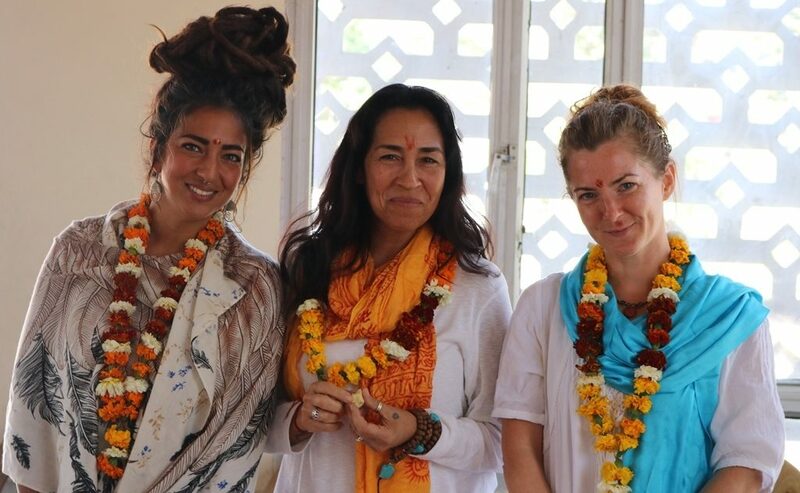 It was a beautiful, unique experience, where we observed the chanting of mantras; sacred flower, water, and fire, rituals; and where we were actually personally blessed by the Temple priests with holy water from the ganga, and with a garland of fragrant flowers placed around our neck. I had the opportunity to attend many different Temple ceremonies while in India, but this one felt particularly meaningful and special, as it was a private one just for us students. We were not cramped into a big, busy, loud, noisy, crowd which is often the case in India, but had the freedom of space, quiet peace, and time to take in our surroundings. Then, the training began. Both Shiva and Vladimir were kind, yet assertive teachers – expressing both soft and hard qualities like the Shiva/Shakti energies of Tantric Philosophy! 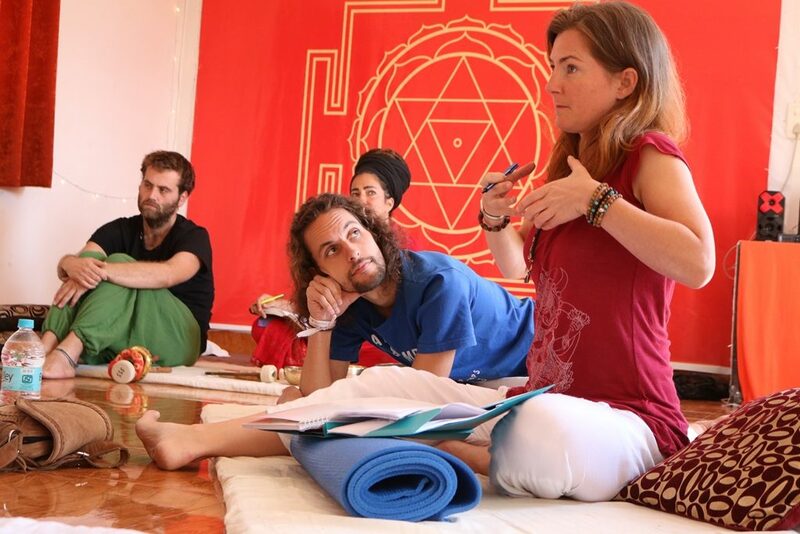 We were guided expertly and surprising quickly in this intensive training in how to both play and use the Tibetan Singing Bowls in many different ways, including how to give private aura cleanses, sound baths, and sound massages, as well as how to provide group sound baths. The process of learning these techniques is particularly enjoyable, because by practicing on each other with your fellow students and peers, you also get to receive the different types of sound healing offerings as well! Not only are you learning about the benefits, but you are also receiving and experiencing the benefits first hand! 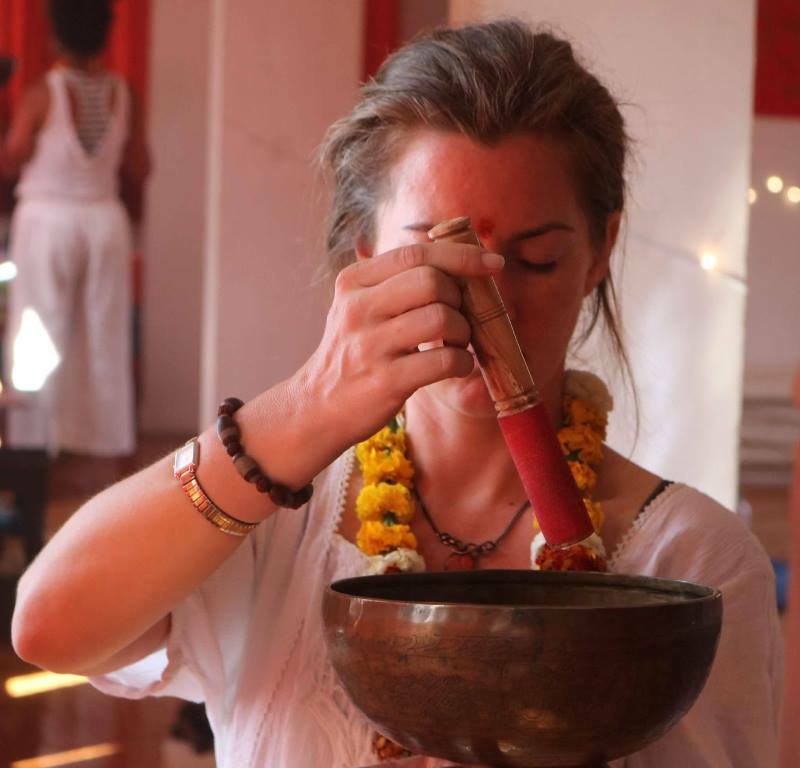 There was a part of me that, even though I was drawn to this training, was a still a little skeptical about the power of the Tibetan Singing Bowls – I mean, can the act of just being exposed to the sounds be truly that transformative? I discovered the answer was a resounding YES, YES, YES! I will always remember the moment when a dear fellow student, Eva, was practicing the techniques on me, and suddenly, I was just overwhelmed with emotion and old forgotten memories, and broke into tears. Now, this has certainly happened to me in yoga asanas before, and different meditations, but there was something very different about this particular experience. For the first time ever, the tears truly felt peaceful and easeful, like the true ‘letting go’ you hear people talk about – it wasn’t a strained, painful cry – but incredibly soothing and powerful. I felt so refreshed, lighter, happier, more peaceful and calm after the treatment, and so from that moment on I was hooked! You don’t often get such personal benefits for yourself during a training where you are learning to give to others! Another great benefit I received from this training was learning how to follow my intuition. Although there are certainly some very specific techniques and processes that are taught – an equally important part of this training is learning how to “hear” and follow your intuition. At first, I really struggled with this aspect, and was experiencing a lot of negative judgements about the training! Being a westerner, we are really taught to value scientific fact over the intuitive wisdom, and this training was really bringing up my resistance to opening to my intuition! Intuition was always something I felt I lacked, and here suddenly, I was being not only encouraged, but actually required, to tap into that wisdom source. But with the gentle, yet firm guidance of our teachers, I soon began to feel more confident in ‘playing’ with the energies, and a sense of freedom came over me that I am happy to say, has stuck with me even more than a year after the training. It is by using the Tibetan Singing Bowls that I was finally able to access this ancient, important skill, and I am so grateful to Shiva, Vladimir, my peers, and this training program for opening me up to the wisdom that is already inside. We were also guided into using other special passive-active dynamic meditation techniques in order to prepare our clients to receive the sound, as well as how to bring clients out of a session at the end – all incredibly important parts of leading sessions on our own. In fact, it is truly amazing just how many skills they were able to cram into this training, without making you feel overwhelmed with too much information. I think that’s due to the practicality of the program, and its focus on experiential teaching, versus just theory. The experiential nature of the training program also leads to you developing very close relationships with your peers. In fact, one of Shiva’s specialities is in both guiding us through, as well as teaching us how to guide others, in using heart-opening practices that create deep bonds between participants. Although we are all worlds apart, I am still Facebook friends and communicate often through messenger or even skype with many of my peers from this program. The ending rituals we all did together as part of our graduation ceremonies with Shiva were deeply powerful, connecting and meaningful, and many of our members continued to spend time together after the training, joining together for the Indian festival of Holi, and even going down to the Ganga together to cleanse and empower our newly acquired Tibetan Singing Bowls with the holy water of the Ganga. 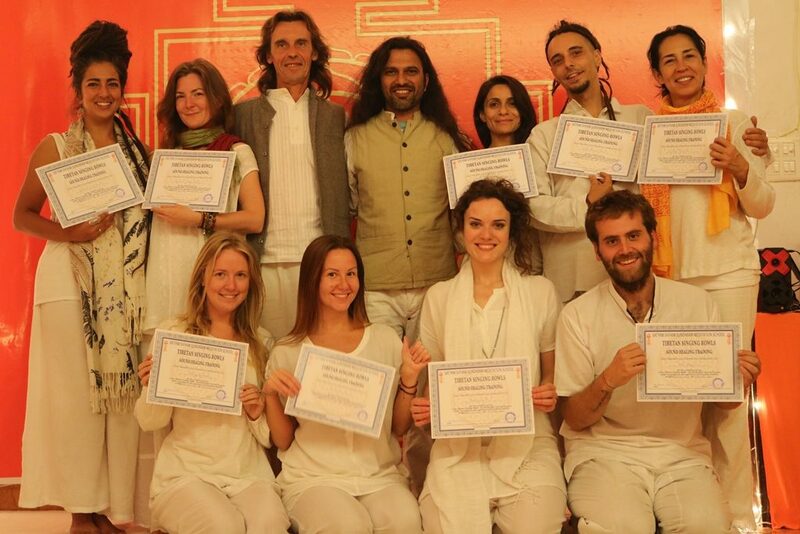 Yes – you will also have the opportunity to acquire your own set of Singing Bowls in this training! We were brought to an area of town that sold singing bowls, and were guided by our teacher Vladimir, in how to pick out our own set of singing bowls – whether we wanted to start with just one, three, or even seven bowls. I was thrilled to come away with my own set of seven bowls, and they have become my most important tool. 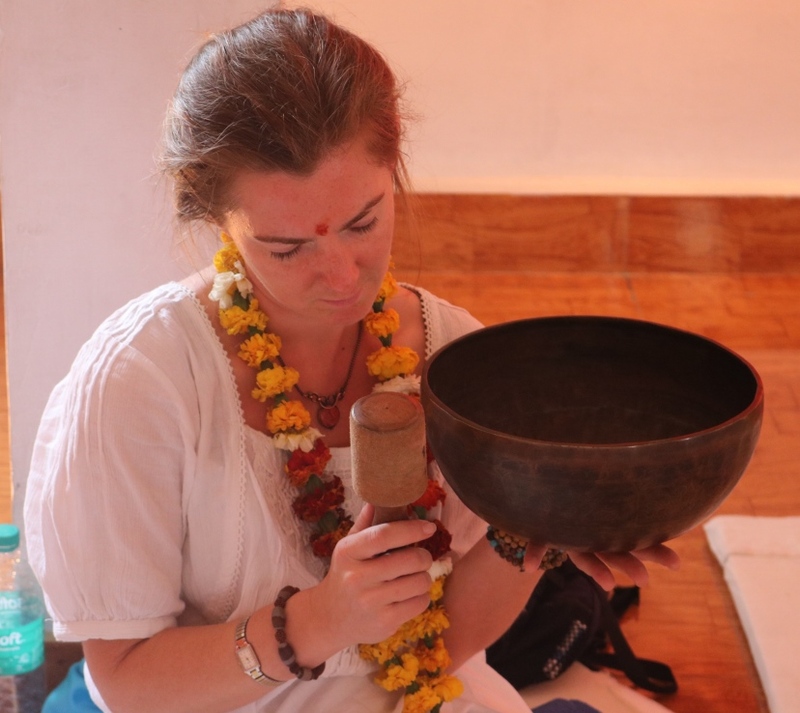 In fact, although I did several trainings while in India, and was already a 500 hr Advanced Yoga Teacher, teaching yoga full time back home, my offerings have now shifted to mostly offering Singing Bowl sessions to both groups and individuals. The flexibility in how you offer sound healings is also wonderful – you can literally create unlimited ways to offer this service, whether as a stand-alone service, or as part of other workshops. I have offered the Singing Bowls on massage tables, in yoga studios on the floor, in people’s living rooms in lazy-boy chairs, on the green grass outside, on the beach during a 108 Sun Salutation celebration, and even in the middle of a busy store in the mall! The opportunities are endless. The world is HUNGRY for these services, and it can absolutely become one of the most useful, transformative, and needed offerings that you could provide. 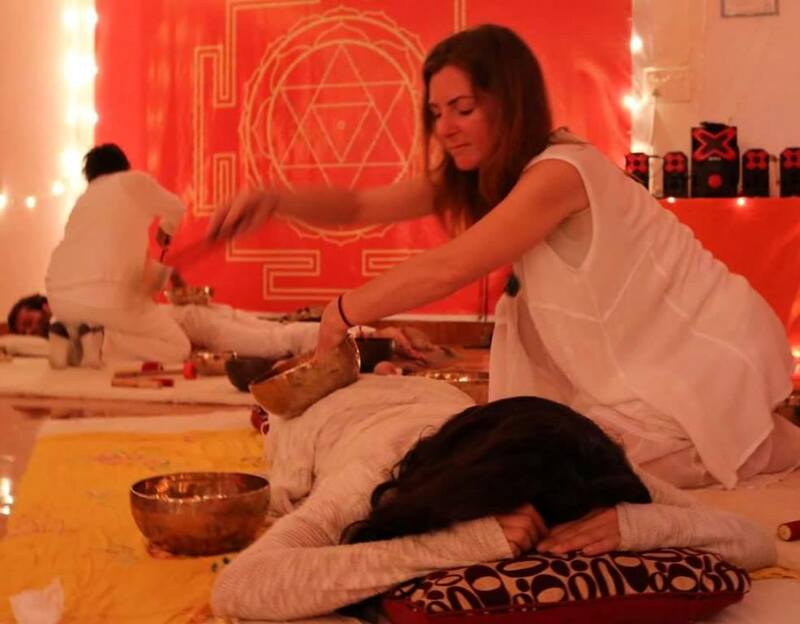 If you are feeling the call to provide the gift of sacred sound to others, I cannot recommend Shiva’s (or any SAMAVEDA affiliated program) training enough! Dive in. You won’t regret it.